Watches are statements of intent, a fashion piece that can make the drabbest of outfits drip with style and swagger. That is, if you could afford a good watch. As much as you’d love to buy watches advertised by smirking Formula One drivers and tennis players, the price-tags meant they were the preserve of the mega-rich. And, while that's still true of proper mechanical time pieces, you can still pick up a respectable, fashionable Quartz watch without breaking the bank. Here are some amazing watches you can pick up for less than £200. Who said you can't get a Swiss-made watch for under £200? It's no compromises as well, because this affordable Swiss watch is actually attractive as well. Based on the iconic design of the Swiss Railway Station clock, it's easy to read and stylish. The polished stainless steel case is waterproof to three bar, and the crystal glass covering the face is domed for a magnifying effect. If you need something that can take a bashing - look no further than G Shock. This affordable model is looks great, with both the case and strap made from matt green resin, and the lens featuring protective mineral glass. This surmounts to a watch which is submersible to 200 metres and is pretty much explosion proof. If you have desires to join the SAS, or become a survival expert like Bear Grylls, buying this watch is the first step on that journey. Just slipping it on will make you feel more extreme. The piece also packs in number features, including multiple timezones, a stopwatch, timer and five alarms - so you can wake up in time for your mission, then time how long it takes to take out a terrorist cell. Skagen is a Danish watch company. It’s worth mentioning that Skagen is Danish (in case the name didn’t give it away) because their watches have all the hallmarks of Scandinavian design – minimal aesthetics, a streak of retro, and a cool font. It doesn’t look like it costs a million dollars but this watch proves that they don’t have to have premium looks to leave a lasting impression. The slick design does all the work here and will ensure you keep running your hands through your hair/yawning and stretching your arms out/waving your wrist around to make sure your present company gets a good look at your time piece. This analogue timepiece is even capable of counting your steps and sycning with your phone. Not bad, eh? 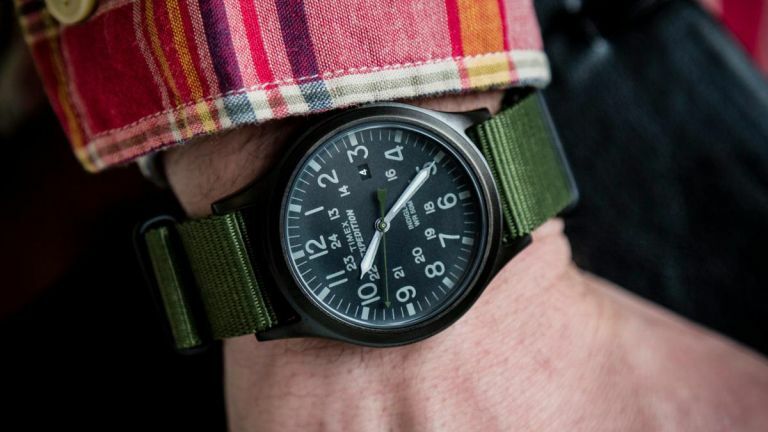 The Timex Expedition Scout is an attractive, lightweight piece which has a rugged, outdoorsy aesthetic to it. The easy-to-read face features Timex's brilliant Indiglo night-light. The model range is derived from the virtually indestructible 1960s infantry watches and adapted to meet the explosive growth of outdoor activities in the 1990s. Looking for a budget watch with plenty o’ tech? The Citizen EcoDrive Dive watch is for you. It’s powered by Citizen brilliant EcoDrive technology, which harnesses power from any light source (even artificial lighting) to keep ticking all day long (with a 7 year power reserve). Honestly, you’ll never need to change a watch battery again. This is a functional piece as well, with features including a screw-down crown and screw-back case, luminous markers, one-way rotating slide rule bezel and highly-legible dials, it’s a true Divers watch. Think budget watch and the first brand than comes to mind is probably Swatch. It's one of the biggest watch brands out there. The Sistem Fly from the iconic Swiss brand isn't your typical plastic affair either, it's made from stainless steel and fitted with a brown leather strap. Hidden underneath the beautiful blue dial isn't your typical Quartz movement, the Sistem is fitted with an analogue automatic movement with date function. That's very impressive for a watch that costs less than £200. If you're looking for something iconic, look no further than this timepiece from Braun. The company's minimalist, clean aesthetic, was introduced by renowned German designer Dieter Rams, was built around the brand ethos - less, but better. Rams and his colleague Dietrich Lubs launched a range of functional timepieces based on the established visual language that made Braun products iconic. In recent years this range has been re-established and revived, so you can now buy a piece of design history for under £200. Seiko has been known for precision, reliability and excellence since 1881, so just because this piece is inexpensive, don't think it's not a well-made watch. It's the everyman's Rolex, if you will. This particular model features a sporty face and chronograph movement. The bezel rotates, and most importantly of all, it's waterproof to 100 metres. The large Fossil watch features a black two-layer dial with brass/gold roman numbers and indices. The black 43mm stainless steel case is water resistant to 5 ATM and is finished off with a tan brown leather strap and brown stitching. Just like the Skagen, the Fossil also also capable of counting your steps, tracking your sleep, and syncing data with your phone. This classic piece from Tommy Hilfiger features a beautifully clean face encased in a stainless steel case. The face features a moonphase complication, which illustrates the illuminated portion of the Moon, as seen from Earth. It's water resistant to 3 ATM (30 metres) and is finished off with a sophisticated brown leather strap. If you want something big and show-off-y, but don't have several grand to blow on a Hublot, this piece from designer Michael Kors should do the trick. The luxury watch not only looks good, but also provides maximum functionality with a clear chronograph movement and date window at 6 o'clock. The chunky 48mm rose gold case is water resistant to 10 ATM, and attaches to a comfortable black silicon strap. Daniel Wellington is a very cool watch manufacturer at the moment, famed for making simple, pretty timepieces. The brand started when Filip Tysander, the founder of Daniel Wellington, met an gentleman called Daniel Wellington while on travelling in the UK, "the man had the inspiring ability to be gentlemanly but still relaxed and unpretentious. He had an impeccable style, and loved to wear his Rolexes on old weathered Nato straps". The pieces follow this ethos, practical, well-made, and timeless. -Lacking bells and whistles-Perhaps too simple? East London’s Unknown has a wide range of watches that ooze class and sophistication, all limboing under that all-important £200 price ceiling. Their watches are simple and elegant affairs and this one is our favourite, the black and silver colour combination making it work with almost all outfits (except neon-bright Hawaiian shirt summer get-ups, but you’re mostly on your own with that one). Bonus points for having such a cool company name – having ‘UNKNOWN’ stamped across the dial adds an extra element of mystery and intrigue to the watch. Honestly, it does. Wait until you see how many people ask “why does it say unknown there?” when you wear it. And finally, if you’re looking for a budget timepiece, there really is nothing more affordable than the Casio digital watch. Sure, it’s not the last word in sophistication, but the design is iconic and perfect if you're going for a retro/hipster vibe. As well as telling the time, the Casio features an alarm, calendar and stopwatch. It’s pretty much an Apple Watch. There’s a backlight, for telling time in the dark, and the acrylic window is shatter-resistant, so it’ll probably last longer than you will. All for under £10? That’s a steal, and everyone should have one, quite frankly.